C limbing is a new resource for Upper Dearne Valley Navigators, the purchase of equipment funded by Locala. Our SPA qualified instructor is Ruaridh Scott, and he is asisted from time to time by parent and climbing enthusiast Gordon Skidmore. The equipment arrived late in the season and in 2016 we only managed to get one climbing session in. 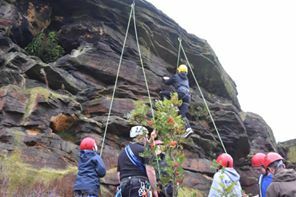 However, with the kit now available the summer of 2017 will see climbing and abseiling as part of our programme on a meeting night at least once a month. We may also be able to fit in some longer sessions if we can find a free slot at weekends.